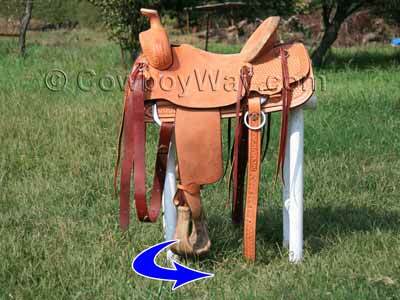 On a Western saddle most stirrups naturally hang so they lay flat against the sides of the horse. They can make it difficult for a rider to get a foot into and out of the stirrups when mounting or dismounting. They can cause a rider pain. When the stirrups lay flat against the horse the rider's hips, knees, and ankles can become painfully strained as their feet and legs turn (or try to turn) the stirrups to a right angle from the horse. Below: This stirrup is hanging flat against the side of the horse. They can be dangerous. When stirrups lay flat against a horse it's easier for the rider's foot to come out the stirrup by accident. In addition, if a rider should lose a stirrup, stirrups that lay flat against the horse are difficult for the rider to find and put their foot back into. Depending on the skill level of the rider and what is happening when they lose a stirrup, not being able to reinsert their foot quickly and easily back into the stirrup could be the cause of, or at least contribute to, a bad accident. For the reasons above and others, most Western riders greatly benefit from "turning" their stirrups. While there are stirrup turning devices available, many people still prefer to train their stirrups to turn. When a rider trains their stirrups they train the stirrup fenders and the leathers beneath them to twist outwards, which turns the stirrups outward from the sides of the horse at a right angle. Turned stirrups offer a rider easier and safer mounting and dismounting, less strain in their legs while riding, and far greater ease in regaining a lost stirrup while riding. Below: The stirrup fender and leathers underneath it have been trained to twist outward. This turns the stirrup outward from the side of the horse at a right angle. 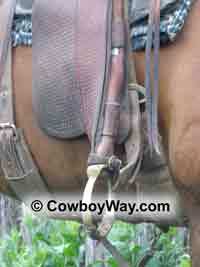 It's easy to train the stirrup fenders and stirrup leathers of a Western saddle to turn the stirrups outward. Step 1: Start by placing your saddle on a saddle stand or something similar, then take your hand and twist the front of one of the stirrups toward the back of the saddle (see the blue arrow in the photo below). 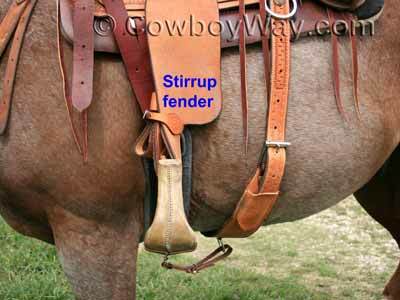 Note: Many people thoroughly wet the stirrup fenders and leathers before they turn them. Wet leather trains more quickly than dry leather, and will give faster results. There are both pros and cons to wetting the leather to turn stirrups; please see more information lower on this page. Step 2: Take a small pole of some sort (like a broom handle) and run it through the stirrup. Run the pole all the way underneath the saddle to the other side and the opposite stirrup. Twist the front of that stirrup toward the back of the saddle, too, then run the pole through that stirrup like you did the first one. See the photo below. The result should be both of your stirrups turned like they would be when you're riding the saddle, with the pole holding them in position. Step 3: Depending on differences in leather and other factors it usually takes a couple of days to a week for your stirrups to become trained to stay in this position when you're riding. To speed things up, or for stubborn stirrups that don't want to train, apply leather conditioner to the stirrup leathers and the backside of the fenders before running the pole through the stirrups then allow the saddle to become very warm (try sitting it in the sun on a hot summer day). Note: Before using leather conditioner always test a small amount of it on an inconspicuous area of your saddle to be sure it won't discolor the leather. After the stirrups are trained, putting the pole back through your stirrups when you're not riding your saddle is good way to keep them in position. As most experienced horse people know, you can train wet leather faster than you can dry leather. When it comes to turning stirrups, you can train them much more quickly if you wet the fenders and stirrup leathers before running a pole through the stirrups. However, whether or not wetting the leather is a good idea has always been something of a debate among horse people. The reason some people wet their stirrup fenders and leathers before training them as described above is that wet leather will train much more quickly. Often, depending on the thickness of the leather and other factors, fenders and leathers that are wetted before being turned can be turned in as little as 24 hours. To wet your stirrup fenders and underlying leathers, first remove the stirrups. Then wet the fenders and leathers (or just the leathers and the backside of the fenders). You can use a bucket of water and a wet rag, a garden hose, or you can submerge them in a bucket of water for a couple of minutes for each side. In all cases, use clean, fresh water only. Dry the fenders with a clean, dry rag, then apply neutral pH leather conditioner. Then put the stirrups back on and run a pole through the stirrups as described above. Apply a little more leather conditioner after the leather has dried to the point where it's just damp. The main cons to wetting stirrup leathers are: 1) Water is not good for leather, and 2) Some leather may discolor if it gets wet. 1) The reason water isn't good for leather is simple: When a raw hide is processed and turned into leather, one of the last steps in the process is called ”fatliquoring.” During this step lubricants that are essential to leather's softness, flexibility, strength, and longevity are infused into the freshly-tanned hide. Later on, if the finished leather product gets wet, water bonds to these lubricants and lifts them to the surface of the leather where they evaporate. After the leather has dried it feels stiffer and isn't as strong because some of the lubricants infused into it have been lost. This is why it's so important to apply conditioner to leather that has gotten wet: The right leather conditioner can go a long way in restoring lost lubricants back into leather, helping to keep it soft, supple, and strong. 2) Some leather may discolor if it gets wet. This is true for a wide variety of leather, but is particularly true of certain types such as roughout. There could be a chance (and pretty much a guarantee if the leather is roughout) that your fenders or leathers will discolor if you wet them to turn the stirrups. Wetting fenders and stirrup leathers before training them will allow them to train faster. However, wet leather will need special care to prevent damage, and some leather will discolor if it gets wet. In a nutshell, then, whether or not a rider should wet their fenders and stirrup leathers to train them probably comes down to two factors: 1) How fast does the saddle need to be usable and 2) How likely are the stirrup leathers to discolor? If a rider can put off using a saddle until the stirrups are trained while the leather is dry, there's really no reason to get the leather wet. However, if a rider has to use a saddle with untrained stirrups right away, then wetting and conditioning the leather may be the safest choice. Some saddles are made so that their stirrup leathers are pre-twisted, or pre-turned. Stirrup leathers like this are sometimes called a "Nevada Twist," an "Oregon Twist," a "Northwest Twist," a "Cowboy Twist," a "twist and wrap," or simply "pre-twisted" or "pre-turned." 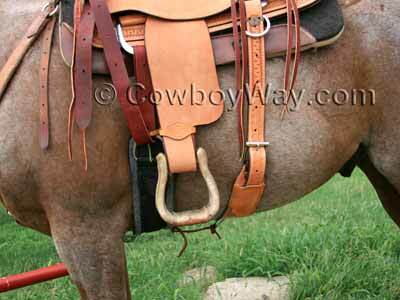 While the exact method varies from one saddle maker to the next, in general a Western saddle with pre-twisted stirrups has had the stirrup leathers underneath the fender twisted then wrapped to hold their position. This is very effective for turning the stirrups outward. 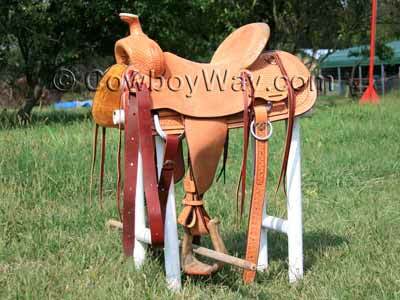 Below: A ranch saddle with pre-twisted stirrups. Note that the stirrup leathers beneath the fender have been twisted in order to turn the stirrup outward, then wrapped to hold the position. In the above article using leather conditioner with a neutral pH was mentioned. What exactly is pH? pH ("potential of hydrogen") is a way of measuring the acidity or alkalinity of a solution. A pH scale goes from 0 to 14, with numbers less than 7 indicating acidity, and numbers above 7 indicating alkalinity. The number 7 on a pH scale represents a neutral solution, or a solution that is neither acid nor alkaline.